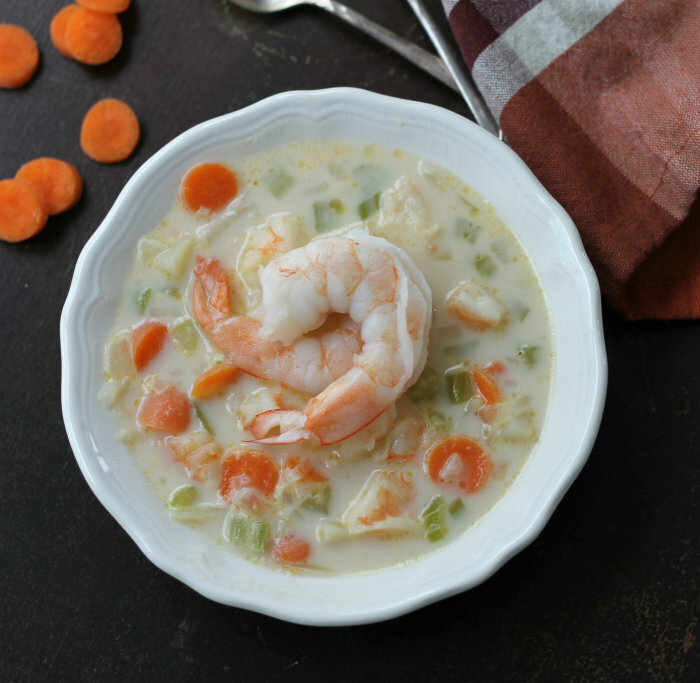 I love a bowl of soup when it cold outside, this potato and shrimp soup hits the spot! First of all I have to say how good it feels to be back. I really missed the interaction that this blog brings. I have met so many wonderful people from all over the world. It’s an amazing thing, the internet, it make the world feel so small!! I thought I would share some exciting news that happened while in my absence from my blog. Mike and I are going to be grandparents again. Yep, this is our second grandchild and we couldn’t be more excited. We have a granddaughter and the one on the way is a boy. We are expecting him to arrive in May and we can’t wait. It is so true what they say about being grandparents… there is no greater joy. On to the recipe… I can’t believe we are in the Lenten season. 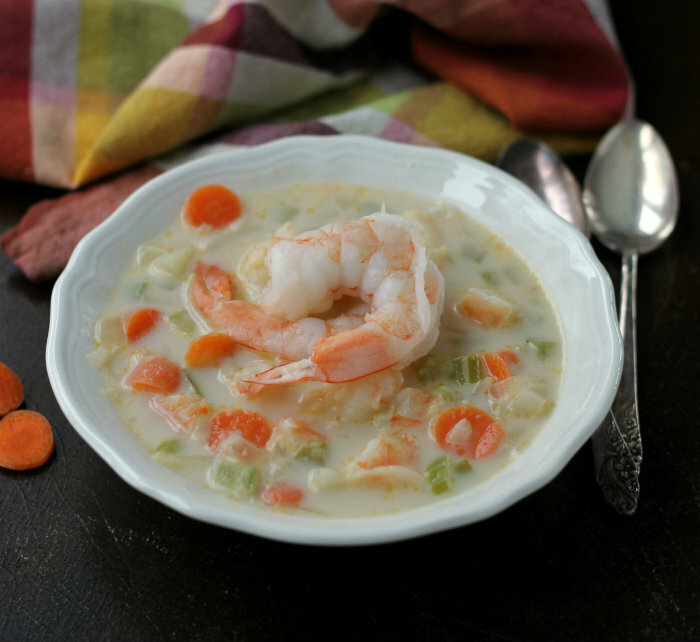 So I thought I would share a simple shrimp soup recipe. Perfect for Lent or when you are simply looking for a meatless meal. I have always loved potato soup and have made quite a few variations. 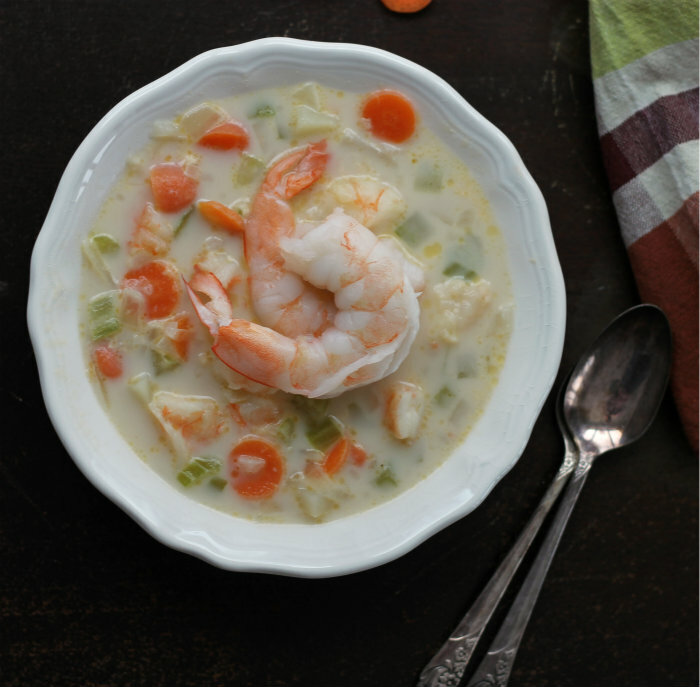 Another thing that I have always loved is shrimp, so I decided to throw the two together for a fabulous delicious soup. I decided to invite a few more vegetables to the making for a bit more flavor and color. It is so true that we eat with our eyes, at least for me… and I love the colors in this soup so bright and bold. I decided to go with a bit of lighter broth, so I used vegetable broth and 2% milk, there is no heavy creams in this one. 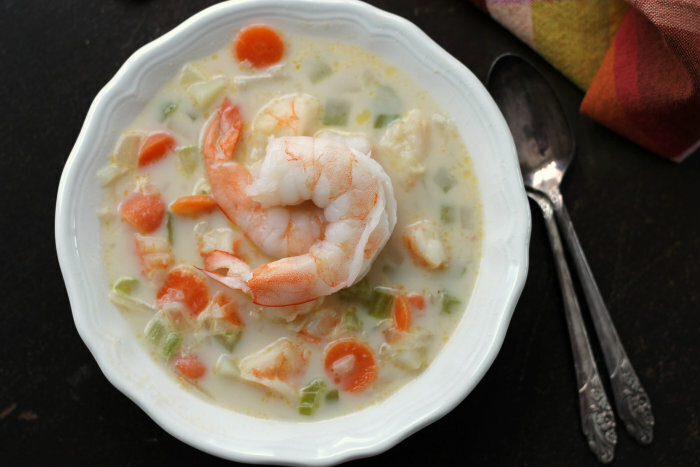 It has great flavor, but not quite the calories of some cream soups or chowders. So for me it is a win win recipe. Who doesn’t want to watch their calories, right? In a large Dutch oven add butter and chopped onions. Cook for 1 or 2 minutes and add flour, stirring until the flour is blended and mixture is paste like. Slowly add the broth and milk, stirring until well blended. Add the remaining vegetables, season with salt and pepper to taste add bay leaves and bring to a boil. Once the mixture comes to a boil turn heat down to medium to medium low and simmer to vegetables are tender. While soup is cooking coarsely chop shrimp. If using raw shrimp add shrimp and cook until they turn pink, if using cooked shrimp cook just until heated. wow those shrimps are so succulent and delicious. A lovely soup, Dawn. Welcome back and congratulations! Your soup looks so delicious and flavorful. I’m loving soups lately during this extra-cold winter we are having. Welcome back, Dawn! I’ve missed your posts. And congrats on grandchild #2—such fun news. Mmmm. This soup looks really delicious. I pinned it for later! Maybe I’ll make it this weekend. Your recipe looks so good. I never would have thought about cooking shrimp like this but, it does look wonderful! Pinned! I am happy that you like the recipe. I hope you check out some of my other recipes! !